Below is a complete list of archived Castlebar bulletin boards from April 1999 up to May 2017. These contain links to the more than 200,000 individual posts that you have made to this active long-running BB. To navigate back through them just follow the "Previously..." links at the top or bottom of the pages. You can also search with Google using site:castlebar.ie after your search phrase. 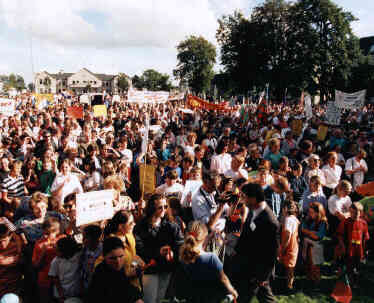 The Bulletin Board Crew about to Proclaim the New Millennium Republic of Connaught on the Mall in Castlebar? Seat of the New Parliament! Christmas 1999, New Year and the Millennium' Beginning: Yank and Tan Accents, Nurse Returns?, The Winter Solstice, Christmas Greetings (lots), A Bright Moon, Anoraks, the many ID of the BB, Off to the pub, A Ceasefire?, Tuar's Panorama of the Mall, New Year Greetings, Y2k Bugs?, Post Millennium Blues, Best Fireworks?, (re)Launch of Sound on the Site, Frank McNamara, Nuts! !, The Traveller Debate, How to find the Car Test Centre, Presents for Roses 18-year old Sister!, The Panto, Car Clamps, Folks back at work again! 10 to 14 febember 1999: End of the CAPS LOCK for MZ, Herbal Trafficking across the Nephin Begs, Cassius Clay, Mass graves, Teachers in St. Geralds, Riddles, Riddles, Riddles, Car Vandals - Reward, More favourites - books, Albert and Rose, What not to do at your Office Christmas party. 29 November to 6 febember 1999: The Glenamoy Peace Process and the offshore bank on Clare Island, Favourite Records etc., Cliff Richard, An Action Man Christmas, the Naughties (2000-10), Spaced out in Castlebar, The Budget!, Drink Driving, PJ delays the Space Shuttle (again). November 22-29 Nov 1999: The 007 premier, drugs in Castlebar, conspiracy theories, the price of drink, Friends, Thanksgiving, Nerds and Geeks!? Pirate Radio, Rockys.